‘ALL-ON-4’ is a new option for affordable dental implants. With All-On-4 dental implants, all teeth can be replaced on four dental implants. Our team of Surgeons, Anaesthetist, Prosthesis and laboratory facilities are all in house, meaning we can replace your full upper or lower arches with four or more dental implants within 48 hours. How does All On Four Dental work? All-On-4 is an innovative dental implant technique where back implants are placed to provide the required support for total rehabilitation. Since fewer implants are used than in older methods, optimal results can be achieved faster. All-On-4 also allows for easier cleaning, helping with long term maintenance. Where only a single or just a couple of teeth are missing, tradition dental implants might be a better solution however where numerous implants are needed All On Four is an ideal solution. Dental implants are small titanium fixtures that are inserted into the jawbone and have, for a long time, been used to support a tooth or a ‘Bridge’ of a segment of teeth. The fixtures form the foundation for the prosthetic replacement teeth. However, when we replace a full set of teeth, often referred to as full arch rehabilitation, whether in the upper or lower jaws or both, we do not need to place an implant under every tooth. 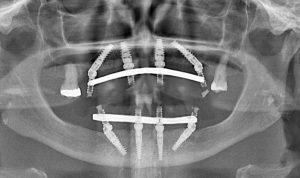 We place 2 implants in the front of the arch and 2 in the back at an intended angle, and together these form the required foundation to support the prosthesis. Although All-On-4 is an advanced surgical procedure, our Dentists are equipped with the experience and specialised training to make it seem simple and leave you feeling comfortable throughout the procedure. Our facilities have the capabilities to provide general anaesthetic or IV sedation as well as an integrated dental implants laboratory. Make an appointment today to explore your dental implant options and whether All-on-4 is right for you by calling us on 0398870888 or book online.